Jonah and I are very excited to announce that JD Hockey Scoreboard is now available for download from the App Store! We have been working on this project for several months, and have included some exciting, hockey specific features. We set out to create a scoreboard that would be perfect for your hockey game, whether played on ice, on the street, gym, or basement! 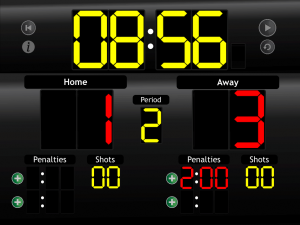 Multiple themes – choose from 3 different text styles for your hockey scoreboard. Faceoff music – get charged up and enhance your game with authentic organ faceoff music between faceoffs. Penalty clocks – manage up to 4 different penalties running at the same time. Shot clocks – keep track of shots on goal with each team’s shot clock. Check out JD Hockey Scoreboard in the App Store today!